If anyone knows about living with bears, it’s the residents of Hyder, Alaska. As the southernmost Alaskan community that you can get to by car, this former mining town sits inside one of the best bear viewing spots in the 17-million acre Tongass National Forest. Hyder is known for having the highest densities of brown bears on the continent. The locals live with the constant presence of bears in the forest, but they also make great efforts to preserve bear habitat – and protect these giant creatures from tourists who don’t know how to stay safe in bear country. “When they start getting food and get used to coming into a campground, the bear almost always gets killed. The bear pays for it, not the people. That’s the hard part, they’re just doing what comes naturally,” says Doyle Hickman, manager of Hyder’s only RV park, Camp Run-a-Muck. Bears prefer to avoid their human neighbors, but the lure of easily obtained food is often too great for them to ignore. Bears’ personalities are as unique as any human’s, but they all have one big thing in common: an incredible sense of smell and a tendency to seek food in the early morning and late evening. A bear’s olfactory sense is over two thousand times as powerful as a human’s. It’s that sense of smell that gets bears into trouble in places where people gather to camp, sleep and eat. 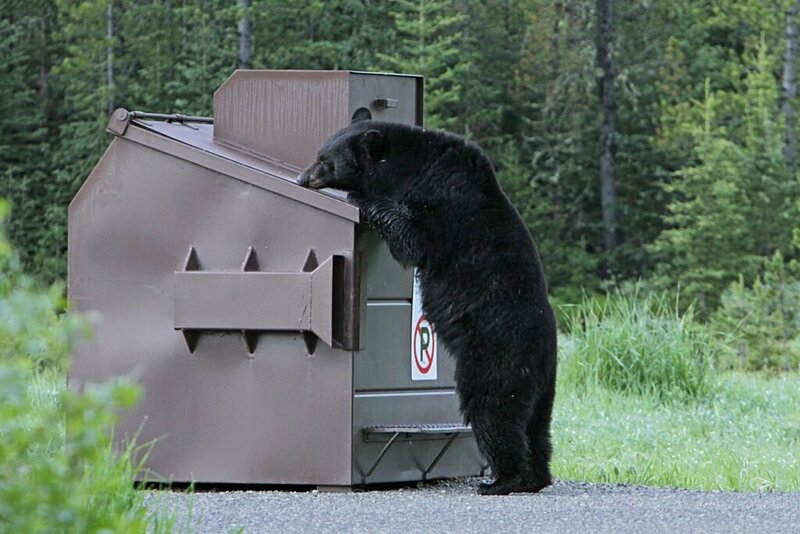 “I’ve seen bears stand up on the sides of motor homes and rock them, when they know there’s food inside,” says Doyle. A hungry bear doesn’t care if the campers are home, they want food at any cost. This former national forest employee also seen bears destroy spare gas cans and chomp on the spare tire of a RV – even while people are home. The taste of petroleum-based products is almost as irresistible as human food, Doyle explains. 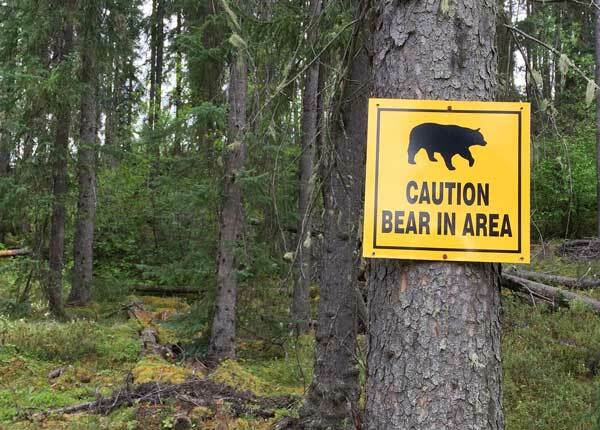 Thankfully you can lessen the odds of a bear encounter at your RV. Just do this one thing to keep bears out of campsites. Keep a clean, odorless RV and campsite. Follow a bland-food menu with items you can prepare outside your RV. Top Ramen and cold sandwiches are two of your best allies against a bear invasion. These mildly scented foods won’t get a bear’s attention the way a barbecued hunk of meat or fish can. If you decide to barbecue, prepare to clean your grill thoroughly after use. Put it away and out of sight during the night for extra safety, even if it has to go in your car trunk. Finally, if you spill food while you’re cooking eating, always pick it up. If you spill food on the table, wipe it down. “Make sure everything gets clean,” advises Doyle. Get rid of anything that can attract bears and they won’t want to stick around your campsite very long. “He might pass through, he might look at a few things but he’s not going to bother anything and he’s not going to stay,” Doyle explains. Food is the main thing that will invite a bear over to dinner, and most likely, to its eventual death. “Taking care that there’s nothing in your campground to attract a bear is the difference between a nice camping trip and a disaster,” says Doyle. A small battery operated or rechargeable vacuum cleaner is perfect for getting up that debris. When you clean up the grill, don’t forget to clean the tools thoroughly, as well. We store ours in a heavy duty plastic bag which came with some equipment we bought, and we seal it with a wire tie. We buy the ties at a dollar store and keep a supply on hand. They come in handy for many things whether tenting or RVing.